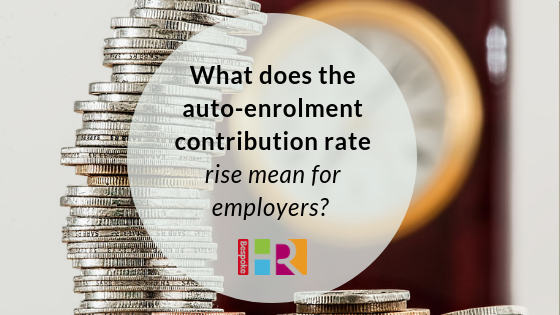 What does the auto-enrolment contribution rate rise mean for employers? From April 2019 auto-enrolment contribution rates will rise from a minimum of 5% to 8% of earnings (which means 5% from the employee and 3% from employers). With nearly 10 million people using the scheme, now is the time for employers to communicate this change to their staff. The changes apply to all employers with staff in a pension scheme, whether its auto-enrolment or an existing scheme. According to the Pensions Regulator, you don’t need to take any further action if you don’t have any staff in a pension scheme for automatic enrolment or you are already paying above the increased minimum amounts. Auto-enrolment was launched in the first place to tackle the huge shortfall in the knowledge around retirement provisions, and lack of savings. The increase in contributions is now because not enough people are saving for their retirement, and still an issue that many haven’t addressed. What’s more, research has shown that employers who help their staff with succession planning are more likely to attract and retain younger staff. Gather staff together for a briefing about the changes, so that they are fully aware of what is ahead and why it’s happening. Use it as an opportunity to talk to staff about financial planning. Skinner suggests asking staff to consider if they were solely reliant on the maximum state pension (circa £8,500 per year) would they be able to live sufficiently? Are they also aware this may not be available until they are 67? Let them know that opting out should be a last resort, and if so then savings should be made elsewhere on non-essential items before opting out even becomes a consideration. Auto-enrolment should be viewed as a forward-thinking initiative and employees should not be led to believe it’s a negative change. Follow up in writing to inform all employees of the changes. Allow for one to one discussion with any staff members who have concerns. Consider inviting a financial advisor as a guest speaker to your business / team meeting to speak to staff about financial planning and ask any questions they may have. Get in touch for more information, or for an informal chat if you have any concerns.